Charles Decrucq, Cuesmes; M.G. Delsaut, Cuesmes; Samuel Delsaut, Cuesmes (sold London, Christie, Manson & Woods, April 14, 1970, no. 41); Armand Hammer Collection, 1970; gift to NGA, 1991. 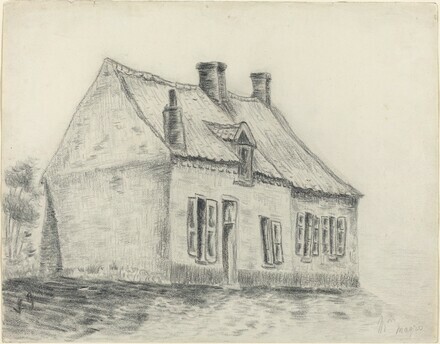 Vincent van Gogh, Cuesmes (Borinage), Belgium, 1960, no. 9. Vincent van Gogh, Musée Jacquemart-André, Paris, 1960, no. 199. Exhibited with the Armand Hammer collection from 1970, starting with Smithsonian Institution, Washington; except Fine Arts Gallery of San Diego, 1971. Remained on long term loan to LACMA following exhibition there in 1983. Exhibited with Armand Hammer collection again from 1985, beginning with Albuquerque Museum; except Birmingham Museum of Art, 1985; Norton Gallery and School of Art, West Palm Beach, 1985; and Palm Springs Desert Museum, 1986. Van Gogh in the Borinage: The Birth of An Artist. Musée des Beaux-Arts de Mons, 2015, 53-54, 255, no. 40, repr. p. 118 (color). The Letters of Vincent van Gogh to His Brother, 1872-1886, London, Boston, and New York, 1927, vol.1, pp. 220-25, letter number 136. Museum Journal (Stedelijk Museum, Amsterdam), ser. 5, no. 4 (Oct. 1959): 80-81. Tralbaut, Marc Edo. Le Mal Aimé, Lausanne, 1969, p. 63. Bernard, Bruce. Vincent by Himself. London, 1985: 23.